Cipherlab 1000 USB – contact imager: eliminates many scanning errors, Reads up to 67 mm wide barcodes, up to 3 mil and up to 30% PCS. Widely programmable, supports three sets of data editing, interface selection and symbology configuration. Supports multiple languages for worldwide applications and includes ScanManager software. Rugged, reliable, and backed by a 5-year warranty. Low power consumption, also available in black. 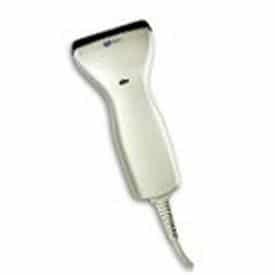 Cipherlab 1000 USB Barcode Reader (CCD) in Light Grey. Complete with USB (Human Interface) cable. No external power supply required.